The Vector gold Expert Advisor looks for strong price movements and trend reversals. The system is based on volatility breakouts. Stop loss and take profit levels are set for each order, trades are additionally managed by trailing stop. If there is a strong movement on the market, the EA opens a deal and moves stop loss to better positions as soon as possible. The EA works best on the following pairs: XAUUSD. 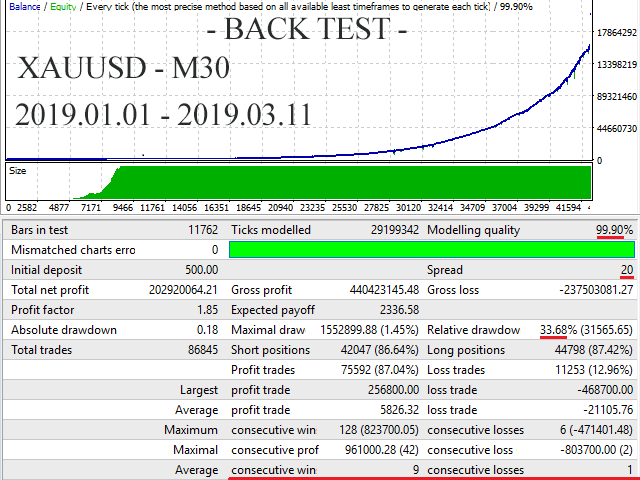 All optimizations are based on the leverage of 1:500 and the fact that a true ECN broker offers competitive spreads and minimal slippage. If you want to trade with a higher leverage, it is recommended to reduce the value of (RiskPercent). Highly recommended ECN account, and VPS, this is important. Before using on a real account, test the EA (a day or two) on a demo account (in the conditions of your broker). ECN account with fast execution. Spread no more than 10 points (the less, the better). VirtualStops - virtual stop loss (in points). Notice: the EA can open several trades in one direction on one pair. This can lead to a drawdown.It is strongly recommended not to exceed the risks. Profits made in the past do not guarantee profits in the future! I have test the robot for almost 1 month and the results are so bad. The robot hardly make any deals and almost all of them lose money- I have already lost USD 400 in my account and USD 600 to rent the EA !!! My brother rented the other 2 (Antique and Monogram) and they are equaly bad. The author keeps saying us that we made bad money management, but I asked him before starting about the settings and he told me they were fine.